Hot this week: Big Europol bustups. Digital repatriation is not an answer to the problem but it is an spectacular example of dynamic public display of an object. The Codex Mendoza (which is not illicit). Some people in a stolen vehicle crashed it into the Wells Fargo Museum and stole some gold nuggets. The objects stolen were two bowls, two saucers and a plate, all white with a blue ribbon around the edge and a blue anchor. Tommy Thompson, who located the SS Central America (and *ahem* “salvaged” all its gold) has been arrested in Florida. 14 countries. 2289 objects. 35 arrests. Discussing two recent operations associated with the big Europol announcement. Tens of thousands of Czech artworks, most of them religious, were illegally removed from the country and are in the EU. A new EU directive may make it easier for churches and owners to claim them back. They originally paid 76k Euro for the piece but what they paid the heirs has not been revealed. 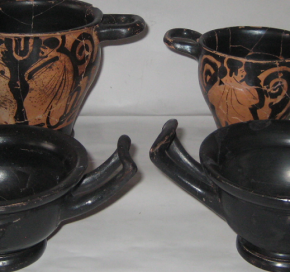 Related to the more general story of seizures in Europe, 36 of the seized objects are Egyptian. Thieves entered the sanctuary of Our Lady of Franqueira and stole the silver chain and crown off the Christ child on the main altar. Some Olympic curling medals, four club medals, and a silver casket were taken from the museum in April and three men have been reported to the Procurator Fiscal regarding the theft. The pop-up online auction firm Arthouse Auctions is accused of selling numerous fake Aboriginal works to ‘small time’ collectors. At least 15 fakes attributed to Barbara Moore, 9 to Tommy Watson. The man accused of the theft of the idol of Lord Raghunath has been named. He is a Nepali citizen and India is trying to have him extradited. He apparently confessed to the crime to Nepali police. It is wonderful that the idol of Lord Raghunath has been recovered but major questions are being raised about temple security. Idea offered that if the public were told the monetary value of antiquities they would do more to protect them. ANOTHER idol theft. An old Jain temple at Korhar Bazaar, Allahabad was robbed of 3 astadhatu idols were stolen. Angry locals gathered in front of the temple, stopping traffic. The police used Google Earth to pinpoint the exact location where idols stolen from a temple were buried by the thieves. Police used WatsApp to contact their counterparts in Nepal. Thief revealed he had contact with a monk in China who would ‘dispose’ of the idols. Because of a spate of idol thefts, 50 out of 1330 Malabar temples were told to install CCTV and fewer than 10 actually have. Rs.40,000 was available for upgrades.